But hairstylist Chris Appleton, the same hairstylist who took Kim Kardashian platinum blonde earlier this year, has a different name for the her new hue. 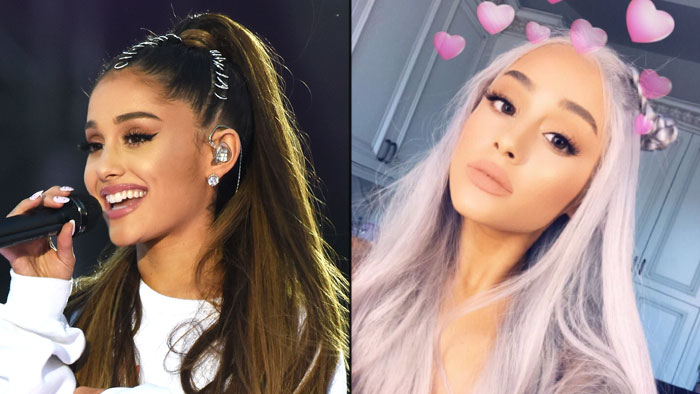 He also shared a shot of the 24-year-old singer and said, “Who loves @arianagrande silver hair as much as me?” Stylish could actually see how her new color also looks a little Millenial pink (another trend) or lavender. And we’ve seen her in soft shades like this before. Fans of the singer may remember her lighter look from her 2015 music video for “Focus,” where she donned a long platinum wig as well as a soft purple one. Ariana also experimented with her hair back in August, when she sported a bright purple bob wig with bangs, but this time, her new hair appears to be the real deal. After her mane makeover was complete, Ariana hit up Halloween Horror Nights in Universal Studios Hollywood with a group of friends, where she wore cat ears, a mask and ditched her usual ponytail to wear her hair down for a change. Regardless of how she styles her strands, we’re digging this new gray hue — it’s fun, expected and glam, all things we’ve come to expect from Ariana Grande!